If anyone seriously believes that Ohio Gov. 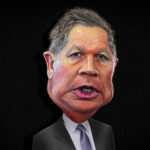 John Kasich has “no idea what the Democrats are for,” as he brazenly told another national TV talk show host and his audience Sunday when he appeared on CNN’s “State of the Union,” they are in need of serious psychiatric help or a remedial course in Kasich history. Not only does Ohio’s current governor know exactly what Democrats are for, since he’s opposed that agenda from his formative days in 1978 as an fresh Republican Ohio state senator, he also knows well what his party stands for after nearly four decades in public office. And never the twain shall meet. The Buckeye State’s quixotic, petulant, temperamental, and easily angered CEO-style leader has mastered the art of the TV lie. He uses purposely confusing statements reporters often interpret as “hinting” at something. Good communicators don’t “hint” at anything; they communicate clearly so their listeners know exactly what s being talking about. Only practiced politicians like Kasich obfuscate, hem and haw, and avoid straight answers to simple questions when they know their monologue will last less than five minutes at best. Basic Kasich instructs to talk using mostly misleading statements on this program or that policy, in order to lead any untrained listener to think this guy’s a little different from the normal rat pack when he’s not. Talking as if anyone outside his inner circle of confidants and kitchen-cabinet friends really listens to him, Kasich made yet another threat about what he’s can no longer do if he doesn’t get his way. That tweet further establishes the widely held notion that Trump never asked Kasich to be vice president, a hyperbolic fake news story Team Kasich floated that Team Trump disputed. Trump no more offered Kasich the VP slot than Trump would have offered it to Hillary Clinton. Soon to be a former governor who won’t have the power and resources of his office to abuse to push his own relevance, now that his relevance has all but faded back home, Kasich desperately wants to remain in the public thoroughfare. His hope is that in 2020, the next presidential election year, there might still be people who remember him enough to consider him an alternative to who Republicans nominate for president, which is likely to be President Trump if he’s still not impeached by then. Always the self-centered politico, Kasich wants everyone to believe he’s committed to the party, and that he wants to win it over from the nationalist, anti-globalist, Trump wing that has risen to power and prominence, and will cut has-been politicos like Kasich off at the knee. The truth about the 18-year congressman turned Wall Street banker and Fox News talk show host is that you can take Kasich out of the GOP, but you can’t take the GOP out of Kasich. He’s hard-right and proud to be a conservative. He’s made that crystal clear, despite the myopia of many, especially Beltway media, to see he’s flimflaming his way forward and daring them to call him on his deceit. Ohio’s lame-duck, term-limited governor is angling to be a stranger in a strange land, where he’ll no longer be accepted as a Republican, as many routinely call him a RINO (Republican in name only). If he abandons his GOP roots, spoiler alert, he won’t be accepted as a Democrat no matter who thinks he talks like one. And if he wants to run as an independent, he knows that’s a ticket to an even more embarrassing loss than he experienced last year when he lost 49 state primaries and caucuses, and only earned one Electoral Collage vote (270 are needed to win). Kasich says he’ll play with fire, but by doing so he’ll just have three more ways to burn himself to the ground. Except for defending expanded Medicaid, which he does for his own reasons which differ greatly from why Democrats defend it, Kasich fails the Democrats’ test on virtually all important issues. From women’s issues to tax issues to labor unions and Planned Parenthood, to privatizing government services, catering to the rich and a federal balanced budget, Kasich is so far right that he can only be bipartisan if he meets Democrats by going around the world the long way. But that won’t happen, no matter how much compromised, easily hood-winked media thinks his odd-duck demeanor and comments are some signal that he’s regained his senses and finally sees the light of what Democrats, progressives, and commonsense independents have come to understand about the issues pressing hardest on the nation’s heart and soul. Schiavoni Announces Jobs Plan To Support Workers And Small Businesses Trump To The Rescue?